President Rivlin tours Gaza envelope, says Hamas terrorists using hospitals and schools, as bases to attack Israel. 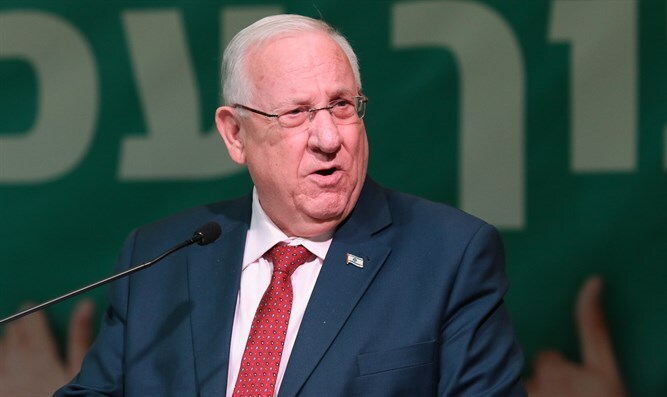 Israeli President Reuven Rivlin accused the Hamas terrorist organization Sunday of turning hospitals and other civilian buildings in the Gaza Strip into terror bases. President Rivlin visited the headquarters of the Gaza Regional Division of the IDF Sunday. He then toured the new neighborhood being built at Kibbutz Nirim, and met with some 250 students and residents at the Nofei Habesor School. Rivlin received a briefing on the current challenges in the sector from Deputy Chief of Staff Maj.-Gen. Aviv Kochavi, Southern Command Commander Major General Eyal Zamir and Gaza Division Commander Brigadier General Yehuda Fuchs who accompanied the visit. "I am coming to you now from meetings with the security forces and from operational surveys," Rivlin said. "We fought for the houses, the kindergartens and the schools, the paths and the fields. It was a war for our existence and daily life." The president said that Israel remains at war with the Hamas terrorist organization which rules the Gaza Strip. "The campaign is over, but the war is not. The mission of the State of Israel has not been completed. We are fighting a terrorist organization that is cruel, extremist, and murderous. It is a terrorist organization that devotes no thought to the future and well-being of Israel, the people of Gaza, and for whom "reconciliation" of one kind or another is only a step towards advancing the war. It is a terrorist organization that does not recognize our existence and whose goal is to destroy and destroy the State of Israel." "Hamas is cultivating terror bases in hospitals, mosques and schools, and continues to invest its energy in military armament, tunnel construction, and planning attacks against the State of Israel. We are not complacent. We know that the next battle, if imposed on us, will be different and harder than the previous one. But we are determined that when it comes, we will be ready and trained. We will surprise and not be surprised, and we will strike the enemy with a hard and cutting blow," added Rivlin. "The entire world must know and understand that the ones preventing the rehabilitation [of Gaza] are Hamas. Israel is the only entity in the region that transfers - regardless of the situation - the minimal needs to the residents so that they can maintain their well-being. Unfortunately, Hamas is exploiting the plight of Gaza's citizens and using the materials - which are sent to the Gaza Strip for the benefit of the lives of the residents - for terror purposes instead. We must not remain silent in the face of these injustices, and we will not be silent in the face of those who point an accusing finger at us. I appeal to all the nations of the world, to all those who have the ability, and the influence, to pressure the governmental system in Gaza, Hamas, to take responsibility for its actions and the lives of the residents. The president thanked the residents of the area and said, "The communities surrounding the Gaza Strip continue to be a source of inspiration for me, and I am hearing about the wonderful growth in the communities, kibbutzim, moshavim and cities of the Gaza envelope, about the young people who want to live here. That is true Zionism, and this Zionism cannot be stopped."